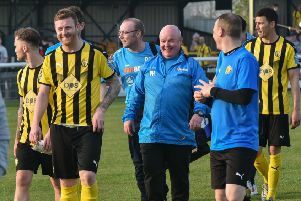 It proved a tale of two goalkeepers on Saturday as Leamington slipped agonisingly close to the Conference North trapdoor, writes Paul Okey. Tamworth keeper James Belshaw walked away with the man-of-the-match award after a string of vital saves, while Brakes loanee Jonny Maddison sheepishly left The Lamb after two blunders undermined a display full of heart and endeavour from the visitors. Not that the blame for this defeat should be laid solely at the young keeper’s door, with a sluggish start and profligate finishing further hampering Leamington’s efforts and ensuring they are very much in Great Escape territory. The return of Danny Newton after a five-match ban gave Brakes the potency they have lacked in recent matches, but by the time he had his first effort on goal, the visitors were already two goals down. With Brakes fans making their way around the back of the Shed stand to take their places behind Belshaw, Tamworth went ahead in the 59th second. Brendon Daniels’ corner was swung in from the left and Shane Clarke rose to send in a downward header which bounced up and seemed to deceive Maddison who could only push the ball into the roof of the net. Danny Newton (partially obscured) adds the final touch to bring it back to 2-1. Joe Magunda’s blushes were spared by a post after he got his clearing header all wrong following a free-kick from the right, but in the 12th minute, Leamington were two goals down. Dave Hibbert got the better of Delroy Gordon on the right flank and his low cross was flicked on by Kayden Jackson for Jon Adams to apply the finishing touch at the far post. Hibbert turned and shot straight at Maddison as Tamworth looked to make it three, but rather than fold, Brakes rolled up their sleeves and enjoyed much the better of the half. Magunda’s cross from the left drew the first save from Belshaw, with the home custodian comfortably hanging onto Newton’s header. Newton then headed powerfully over from a corner, while a superb last-ditch block from Phil Trainer denied Lee Moore after a swift counter from the visitors. The pressure paid off in the 28th minute with the returning Newton adding the finishing touch on the line after Richard Taundry’s long throw had been flicked on by Jack Edwards. James Mace produced a goal-saving challenge to prevent Clarke restoring the hosts’ two-goal advantage, while at the other end, Taundry’s free-kick provided an anxious moment for Belshaw as it fizzed past his far post. Maddison was looking anxiously over to the assistant referee after appearing to claim a bouncing ball outside his area, but the officials were not interested in home appeals. Belshaw was then called into action at the other end, producing a superb finger-tip save to divert Newton’s close-range header on to the crossbar. He was powerless seconds later when Gudger let fly from 25 yards and was again rescued by the woodwork, with the shot thudding away to safety off the far post. Brakes’ assault on the home goal continued after the interval with Jordan Goddard denied by the feet of Belshaw after getting a shot way inside the Lambs’ box. Mace was left kicking the post in frustration after powering a header over the bar from close range and Magunda was also wasteful after Newton picked him out on the angle of the six-yard box. Newton lashed a half-volley narrowly over after pouncing on a defensive error as Brakes kept their play-off-chasing hosts pinned back. Edwards’ header to the far post then picked out Mace, but with the angle against him, he was denied by the feet of Belshaw. Tamworth boss Andy Morrell made two substitutions to try and stem the flow and it was one of his replacements, Leon Mettam, who made an immediate impression. There seemed little venom in his effort from just outside the area, but Maddison made a hash of his dive, allowing the ball to escape his grasp and trickle over the line via a post and the keeper’s back. Reece Styche fired over as Leamington were left exposed at the back, but the visitors were handed a lifeline in the 87th minute. Home keeper Belshaw was no sooner announced as man of the match as he was picking the ball out of the net, beaten by an unerring strike from Newton from just outside the box. However, he was to re-establish his star man credentials in the closing stages, saving bravely at the feet of Ashley Worsfold after a goalmouth melee and then standing up well to parry away a fierce half-volley from the loanee striker. Tamworth: James Belshaw, Rob Purdie, Joshua Sampson, Tom James, Phil Trainer, Jonathan Adams, Paul Green (Connor Taylor, 60), Shane Clarke, Kayden Jackson (Leon Mettam, 66), Dave Hibbert (Reece Styche, 73), Brendon Daniels. Subs not used: Kevin Thornton, Sean Wilkins. Brakes: Jonny Maddison, James Mace, Connor Gudger, Joe Magunda (Ashley Worsfold, 76), Jack Edwards, Delroy Gordon, Lee Chilton, Richard Taundry, Lee Moore (Bilal Yafai, 82), Jordan Goddard, Danny Newton. Subs not used: Nathan Hicks, Jamie Tank, Lewis Fenney.